Iligan City – the City Government of Iligan under the leadership of Mayor Celso G. Regencia recently received an award conferred by the National Economic Development Authority Commission on Population and Development as the “Best Performing City Population Office in Region X” on the 14th day of March on the occasion of the Regional Population and Development Summit and Recognition at Dynasty Court Hotel, Cagayan de Oro City. 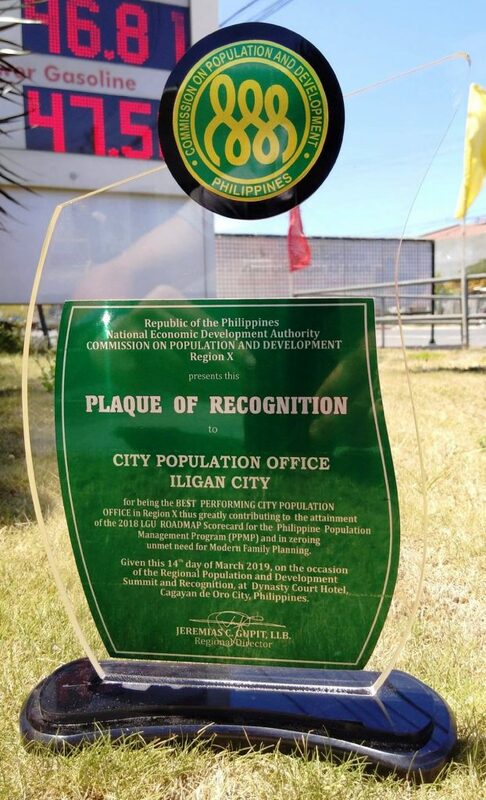 LGU Iligan through the city officials presented the Plaque of Recognition in behalf of Mr. Oliver A. Yap as the head of Population Commission (POPCOM) during the flag raising ceremony on March 25, 2019 at the Anahaw Amphitheater. A notable achievement is indeed fulfilling but is not an easy task. The said success greatly contributes to the attainment of the 2018 Local Government Unit (LGU) ROADMAP Scorecard for the Philippine Population Management Program (PPMP) and in zeroing unmet need for Modern Family Planning. What is the mandate and functions of POPCOM? The Commission on Population (POPCOM) is a government agency mandated as the over-all coordinating, monitoring and policy-making body of the population program. It is the lead agency promoting population activities. It calls for unified, consistent, and integrated implementation of the population program, which will lead to consistency of policies, and programs particularly in population management, reproductive health and family planning. What is the goal of the agency? The Commission on Population (POPCOM) and its implementing partners aims to increase engagement and collective actions in empowering Filipino families in achieving their fertility goals within the context of responsible parenthood, in significantly reducing incidence of pregnancies among adolescents, and in enabling institutions to integrate population dynamics in their sustainable development initiatives. Furthermore, its goal is to increase the reach and impact of the population programs not only among its partners but more importantly to every Filipino leaving nobody behind. This entry was posted	on Monday, March 25th, 2019 at 3:36 pm	and is filed under Flash News. Both comments and pings are currently closed.